Should I Buy Exxon Mobil Stock After Q1 Earnings? Subject: Should I Buy Exxon Mobil Stock After Q1 Earnings? Exxon Mobil stock has been one of the best-performing Big Oil stocks of 2016, up 13% since January. But those gains could soon end after Exxon Mobil Corp. (NYSE: XOM) reports first-quarter earnings at market open tomorrow (Friday, April 29). You see, investors worry the Exxon Mobil stock price will fall after the oil titan likely reports one of its roughest quarters in years. After all, WTI crude oil prices hit a 12-year low in February and have hovered below their 52-week average of $48.36 all year. That's why we're going to discuss if you should buy Exxon Mobil stock after Q1 earnings. Besides revenue and earnings per share (EPS), the biggest figure for Big Oil companies right now is net loss. You see, U.S. energy firms are hemorrhaging money due to the 70% crash in oil prices over the last two years. Oil majors like BP Plc. (NYSE ADR: BP) and Chevron Corp. (NYSE: CVX) saw their annual profit decline 51% and 76% in 2015, respectively. And now, these companies are turning negative. According to FactSet Research Systems Inc. (NYSE: FDS), the overall energy sector is expected to post a Q1 loss for the first time since S&P started tracking energy earnings back in 1999. Analysts surveyed by FactSet expect Exxon to earn $0.31 per share on revenue of $44.8 billion. Although it's not a loss, it would be a sharp decline from $1.17 per share on revenue of $67.6 billion in Q1 2015. Even if the firm beats those estimates and shares surge, you should avoid Exxon Mobil stock in 2016. 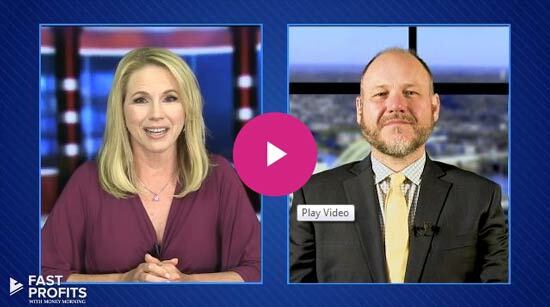 According to Money Morning Global Energy Strategist Dr. Kent Moors – an oil and gas expert with more than 40 years of experience as an energy advisor – these oil majors are in for more losses this year as they deal with massive overhead and operating costs. With over 10,000 gas stations, refineries, and other facilities, Exxon is spending millions to keep the lights on. That's not what an oil firm needs during this low price environment. The best way to profit from $45 crude oil prices is to purchase shares of acquisition targets. You see, this low oil price environment is bolstering merger and acquisition (M&A) activity within the oil sector right now. That's because smaller companies with less capital can't turn a profit from drilling $500,000 wells when oil is this cheap. That means these producers will have no other way to make money except by being acquired by larger firms. "Acquisition targets will be oil companies with attractive pipelines or other assets, high levels of debt, and declining cash flows," Moors said. "These types of companies could hand their shareholders a quick profit if they get targeted." Buying shares of an acquisition target gives investors a quick profit because stock prices typically surge after a firm is bought out. For example, take Royal Dutch Shell Plc. 's (NYSE ADR: RDS.A) $81 billion buyout of BG Group Plc. (OTCMKTS ADR: BRGYY). BRGYY stock cost $13.58 a share on April 7, 2015 – one day before BG Group was acquired. When news of the deal broke, the BRGYY stock price shot up a massive 27.5% to $17.32. If you owned 10 shares of BRGYY, you would've made a 275% return in just one trading session. And according to Moors, this M&A activity won't just give investors quick profits, it's also re-stabilizing the entire energy sector. "The overall goal of M&A will remain the same," Moors noted back in September. "It's to streamline participation in advance of sector stabilization and the inevitable rise in raw material prices." 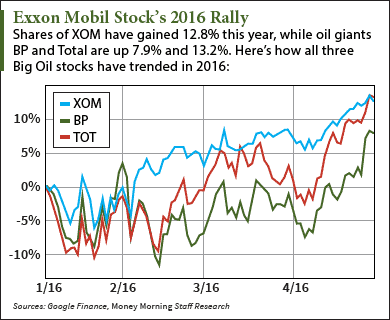 The Bottom Line: The Exxon Mobil stock price has had an impressive performance so far this year. But as oil prices remain far below their mid-2014 peak, oil majors like Exxon will keep losing money until they run out of profits altogether. We recommend avoiding XOM stock in favor of acquisition targets. These will be the companies that offer investors quick and explosive profits as the oil sector stabilizes this year. Alex McGuire is an associate editor for Money Morning who writes about the energy sector. Follow him on Twitter for all of the biggest oil and gas updates. Exxon is making money on its refineries and chemical side, so Yes Exxon is an amazing value at this level.